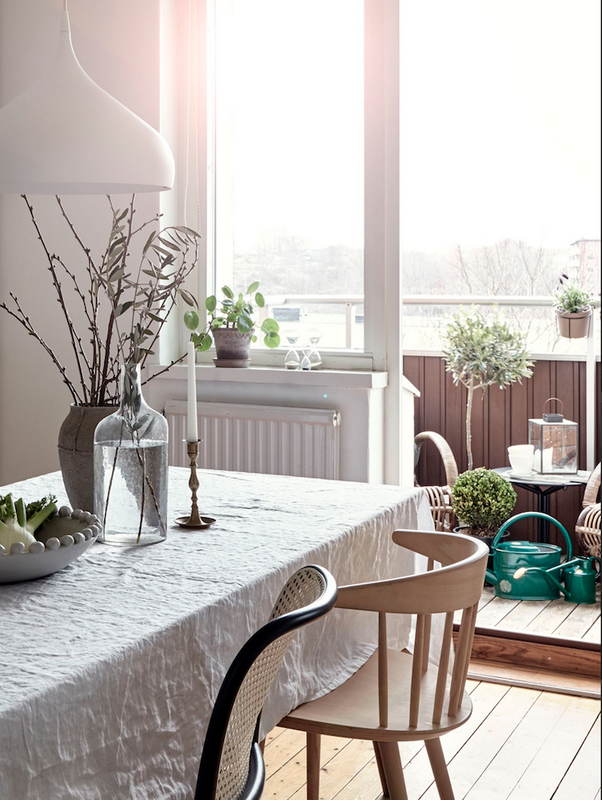 If you're looking for a soft, calm, earthy colour palette for your home- this could well be it! 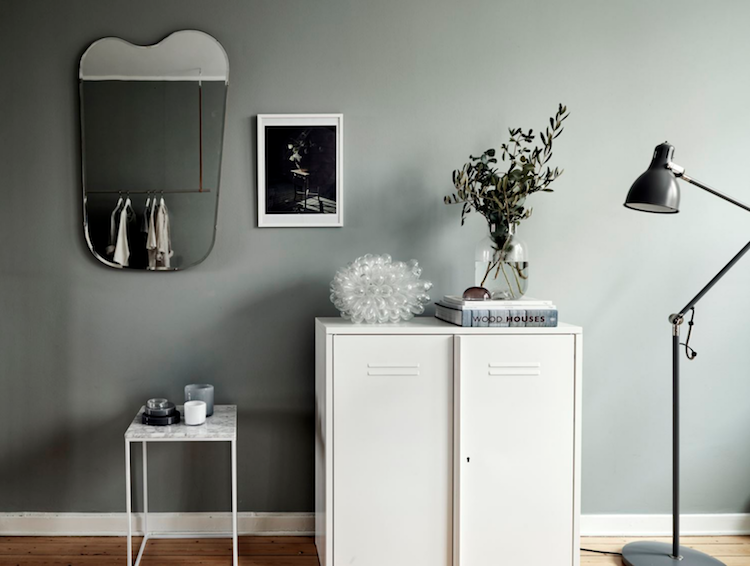 I mean, just how pretty are the shades of earthy green with white, cream and pale grey in this two room Swedish apartment? 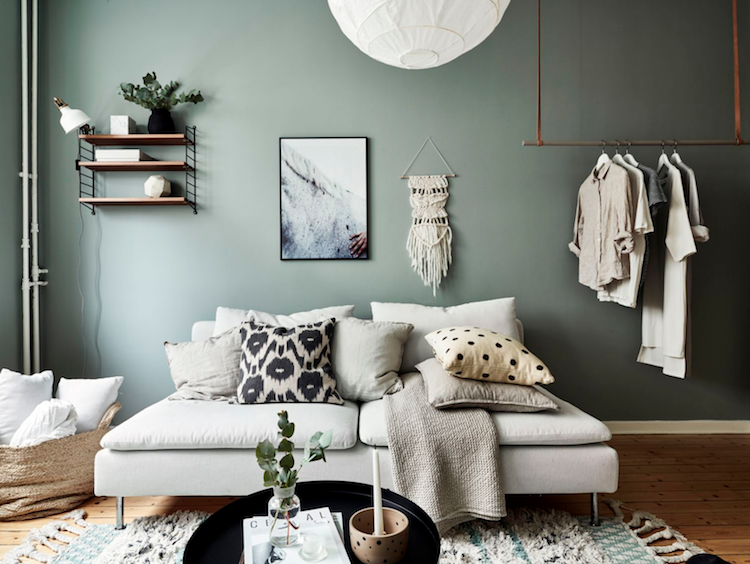 I love all the textures too: hand knotted wall hangings, fluffy rugs, knitted blankets and floaty linens all of which help to ramp up the cosiness. Imagine escaping here each day?! 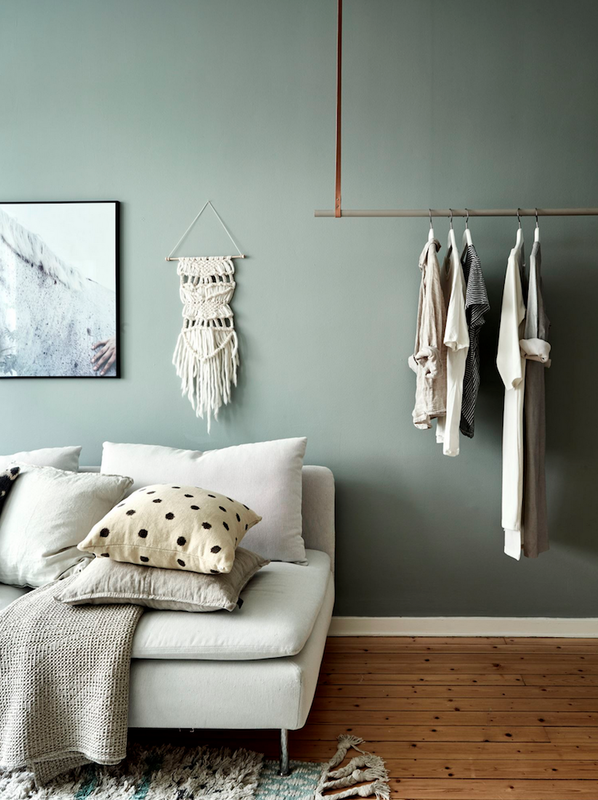 When a bed nook is too small for anything except for a bed - a simple rail in the main living room creates space for everyday clothes (even better if they're coordinated with the look and feel of the room - ha! But since we know this isn't always the case, a back-up cupboard in the hallway works as a perfect overflow!). I'm loving these irregular shaped mirrors. 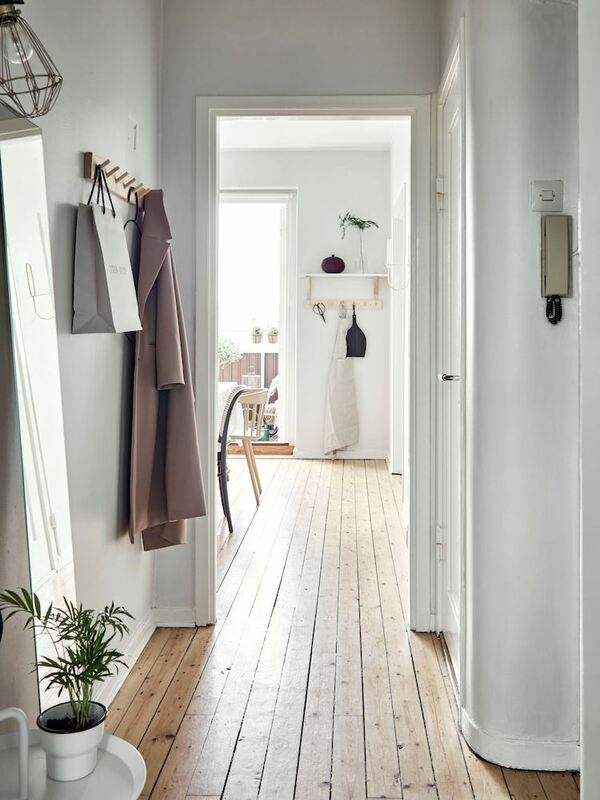 I also spy the Ärod floor lamp from IKEA (we've got this in our home and it goes with everything so is always being moved from room to room! How lovely is this bed nook? 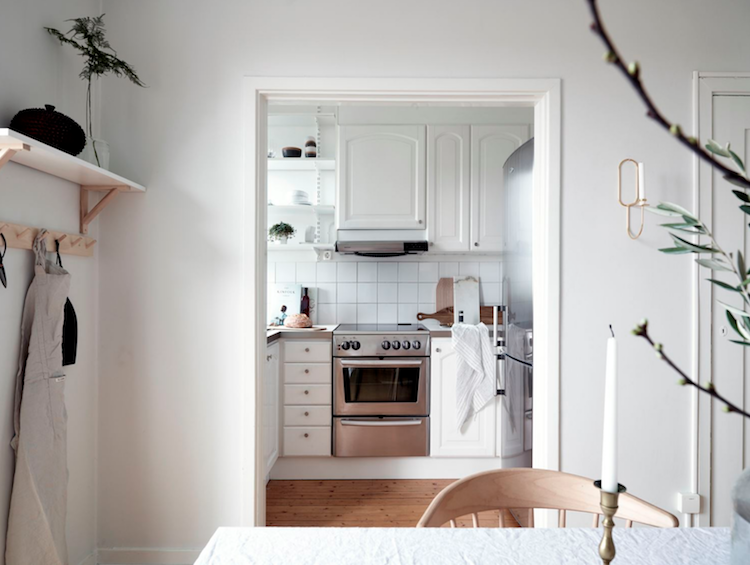 It just goes to show that no matter how small the space, you can still create somewhere cosy and private to turn in each night. 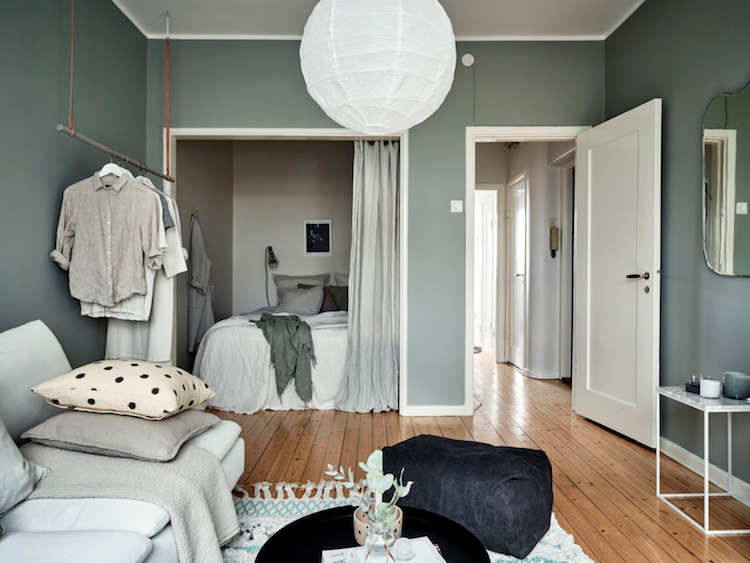 A curtained off bed is fairly common in Sweden (especially in more traditional homes and summer cottages) - check out this and this home for more pretty examples! I sourced made-to-measure linen curtains in my bedroom and sitting room like these from Not Perfect Linen*. 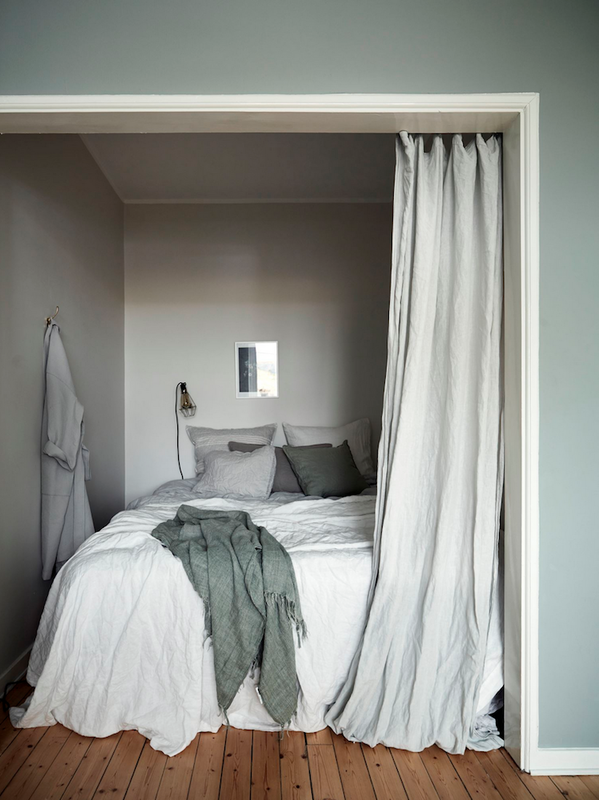 Speaking of linen, the bed nook features layer upon layer of it in soft greens, whites and greys. Just a small reminder (spoken from experience!) - that it's really important to invest in high quality linen bedding with a high flax content to avoid that uncomfortable scratchy feel (not a good thing when it comes to pillows!). High quality linen will also soften with age. I love linen bedding from Secrets and Things* for that reason. Could you imagine hanging about here this weekend? It looks so calm! 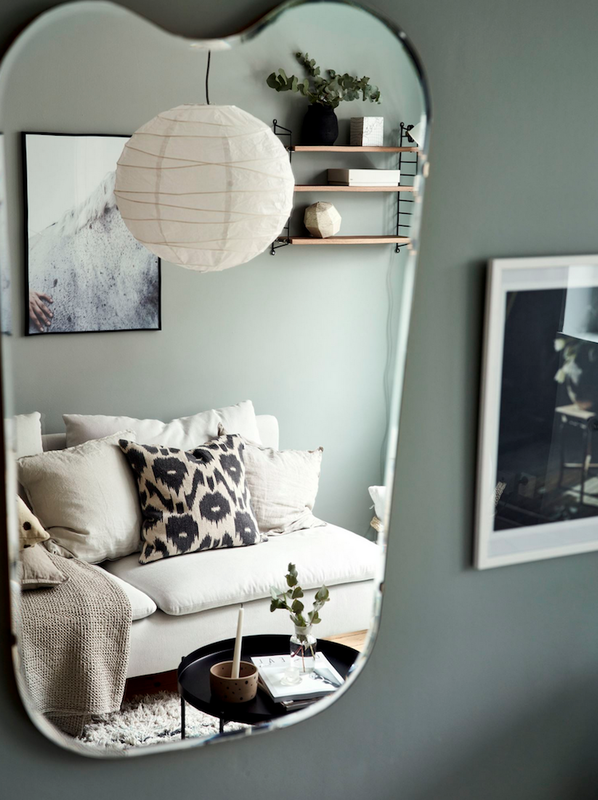 I know this apartment has ben styled for sale and you'd have loads more clobber than this in reality but it is a great source of colour inspiration! 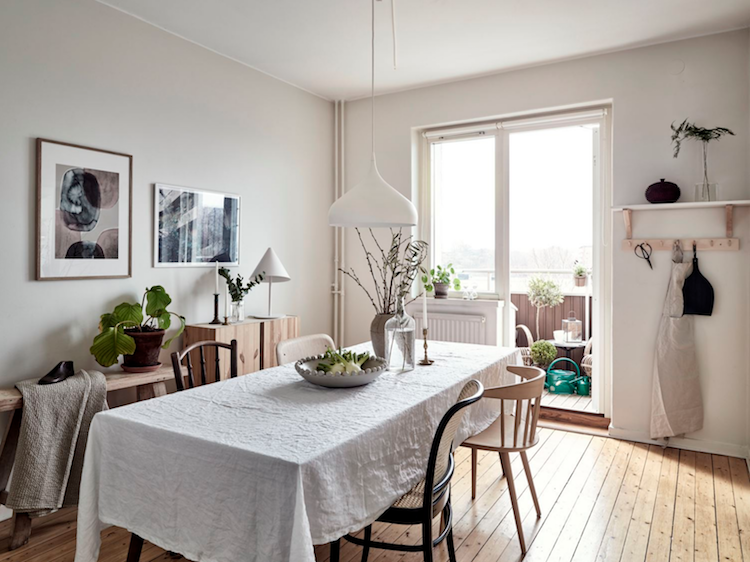 If you fancy checking out other homes with a similar scheme you might also like to check out this beautiful family home (I love the green and pink accents), a calm green, grey and white apartment and a Gothenburg home with an English vibe (one of my all time favourites - hmmm, wonder why?!). Our four day retro VW Camper Van tour of Cornwall, England has come to an end - sniff sniff! Despite a rocky start (driving on the wrong side of the road, map reader not knowing their right and left and a broken radio antenna - not all necessarily connected! ), we're really going to miss Scarlett! Now it's time to go and say a quick hi to my family before we fly home. 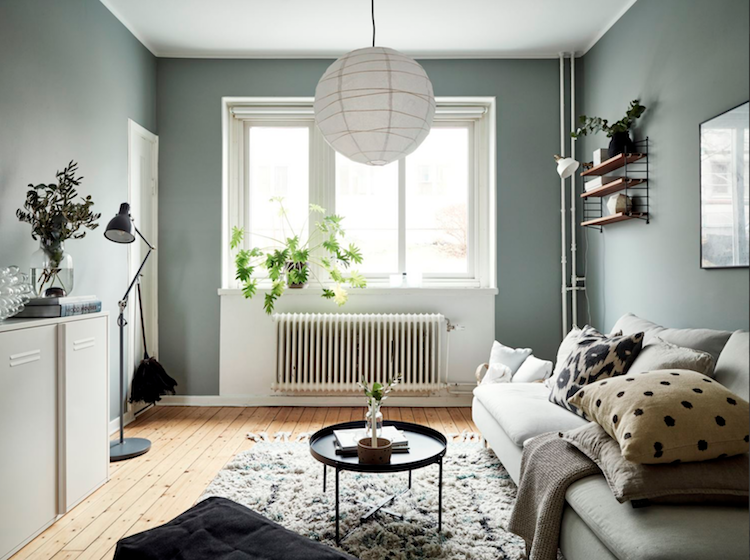 What is this green paint shade? It's lovely! Having a separate work space at home can be a huge factor in how easy it is to focus and get work done at home. Having a room or a space that is set aside just for “work” can help you feel like you have a functional office space separate from your home life. Like wise, having that separate work space can help you relax at home.